Are You Too Successful for Your Current ERP System? Your company is growing, expanding into new markets and introducing new products. Your team is working double-time to make sure your operations and financials keep pace with the demand. Now is the time to consider how a new ERP system can ease the strain. 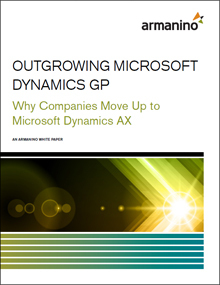 Armanino has written a white paper on the total cost of ownership and easy upgrade path from Microsoft Dynamics GP to Dynamics AX. Growth: Your company is growing in revenues, locations, and/or product or service lines. Global expansion: You’re moving into international markets and need support of multiple currencies, languages and regulatory reporting. Lack of control and insight: It takes longer to get things done. Managers do not get timely information to make decisions due to increased manual processes. Increased manual processes: Your staff is relying more on spreadsheets or even paper-based processes to bridge gaps in control and visibility. M&A activity: There has been, or will be, an acquisition or merger. Complexity: Products, product lines and pricing have become more complex. Too slow: You don’t have timely access to critical performance metrics, financial data, or other critical information. Learn about the total cost of ownership advantages and ease of transition when migrating from Microsoft Dynamics GP to Dynamics AX. To download a copy of this informative white paper, complete the form below and it will be sent via email.